Various measures have been taken to alleviate the burden of opioid-related deaths in Connecticut in recent years. However, these efforts have yet to make a significant difference in terms of reducing the high death rates within the state. There has been a steady increase in total overdose deaths among residents from 357 deaths in 2012 to 1,038 deaths in 2017. In 2016, Connecticut ranked 11th among all states in highest rate of overdoses, with 27.4 deaths per every 100,000 people. Many of Connecticut’s neighbors were among the top 10, including New Hampshire (39 deaths/100,000 people), Massachusetts (33 deaths/100,000 people), Rhode Island (30.8 deaths/100,000 people), and Maine (28.7 deaths/100,000 people). 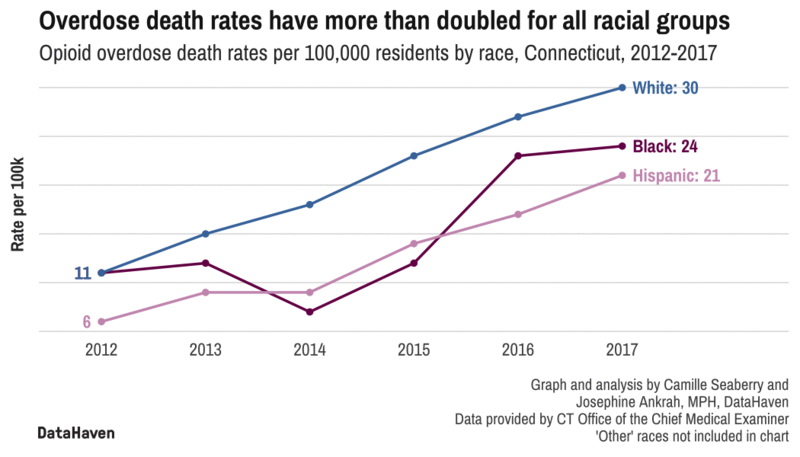 Those closely following the epidemic are aware of the fact that white residents are dying in greater numbers in Connecticut and throughout most of the nation. However, other populations are increasingly being affected at overwhelming rates as well.